Improving lives with resources and opportunities that stimulate creativity and nourish the mind. Our vision is a literate and vibrant community with lives that are enriched by the Farmington Public Library, a focal point that connects and unites people. Through teamwork and innovation, we seek to engage and stimulate thinking, enhance knowledge of the world, and improve the quality of leisure time. We aspire to offer all a safe, accessible, attractive place conducive to lifelong learning, enlightenment, creativity and enjoyment. How can you help the Farmington Public Library? The Farmington Public Library is looking for volunteers to donate their time to help the library become a better resource for the community. If you have the time and would like to help, please volunteer. Don't have time? You can donate to the Farmington Public Library Foundation, which supports many of the library programs you enjoy, like the annual summer reading program, author visits, and more! Come Join Us on a Library Adventure! Tours, Class Visits and Field Trip Policy Before you schedule a Library Adventure for your group or organization, please read through the following important information. 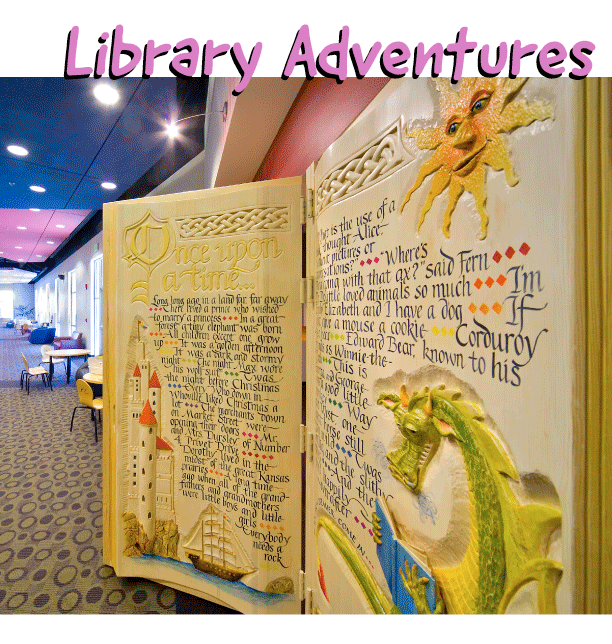 Go to the Calendar Schedule to register online for a Library Adventure!